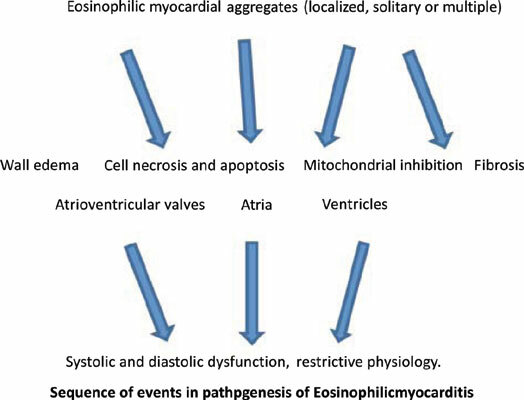 Background: Acute eosinophilic myocarditis (EM) is a rare form of heart failure that is characterized by myocardial eosinophilic infiltration usually in association with peripheral eosinophilia. The underlying cause is variable and can include allergic reactions, parasitic infection, idiopathic hypereosinophilic syndrome, malignancy, Loeffler’s syndrome, Churg-Strauss syndrome (CSS), early giant cell myocarditis and malignancy. The course is potentially fatal, and early diagnosis and treatment with steroids is essential. Conclusion: Here, we present an illustrative case of eosinophilic myocarditis secondary to CSS followed by a brief review of epidemiology, pathogenesis, diagnosis and treatment of both disease entities. Eosinophilic myocarditis, cardiomyopathy, churg-strauss, heart failure, steroids, epidemiology.